Dutch painter, etcher and draughtsman, the greatest artist of Holland. Born into a family of millers in Leiden, where he worked until about 1632, then moved to Amsterdam. 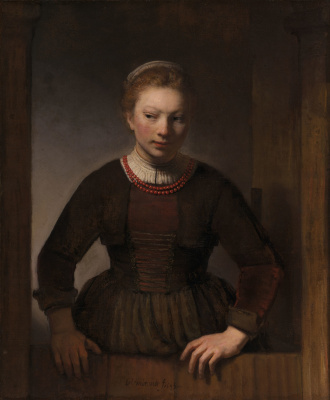 In 1634 Rembrandt married a girl from a wealthy family, Saskia van Uylenburgh, whose image was immortalized by him in many of the portraits with extraordinary tenderness and love. 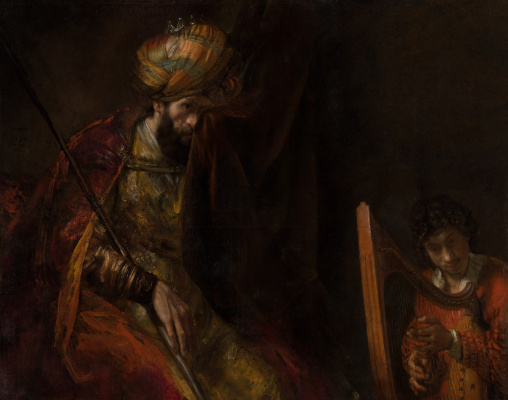 From the 1640s, in the works of Rembrandt, especially in the paintings on religious themes, the importance of light and shade, creating a tense emotional atmosphere. The artist is interested in the hidden essence of the phenomena, the complex inner world of the depicted people. 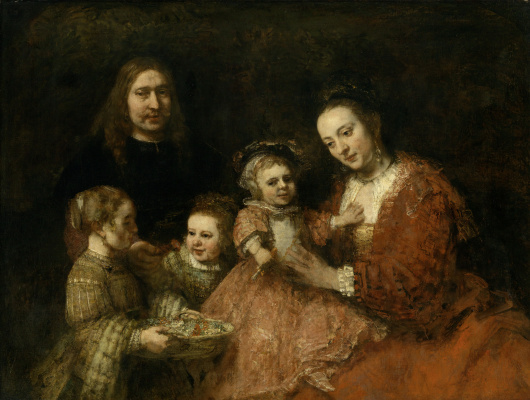 15 July 1606 in Leiden in the wealthy Miller of Gerrits Harmen and his wife, Neeltgen Willems van Sambrook sixth child was born, named Rembrandt. The mill was located near the crossing of the Rhine city, so Harmen of Gerrits began to call van Rijn, and this addition to the names received and the whole family. 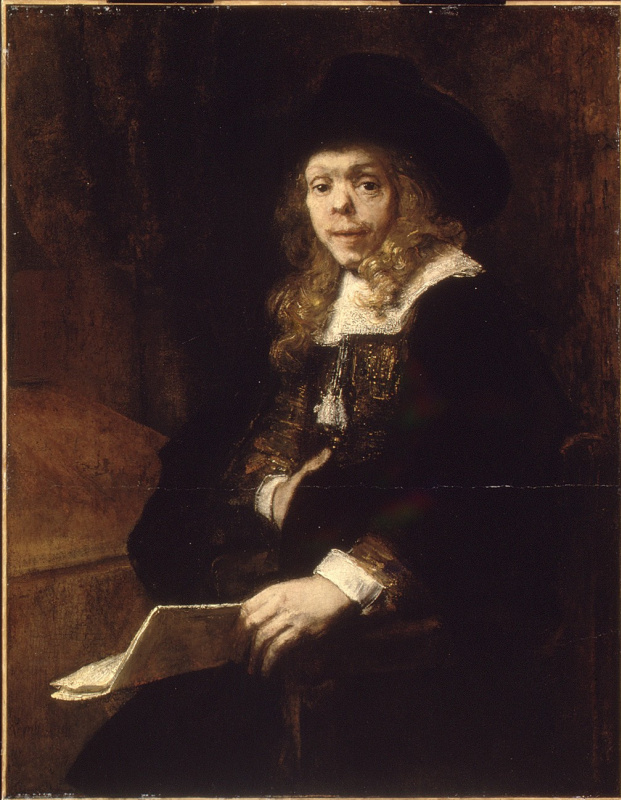 Parents giving Rembrandt a good education, wanted to become a scientist or an official. He studied at Latin school and then from 1620 — Leiden University, who is leaving, not completing it. The desire to paint manifested since childhood, led him to the workshop to local painter Jacob van Swanenburgh, who taught Rembrandt the fundamentals of drawing and painting, acquainted with the history of art. He studied for three years, in 1623 Rembrandt moved to Amsterdam and continued studying with the famous painter Pieter Lastman (1583−1633). But training was continued only six months. In 1624 Rembrandt returned to Leiden and there along with his friend Ian Levinson opens his picturesque Studio. Already in the portraits of Rembrandt’s Leiden period, see the artist’s interest in the inner world of man. Focusing on the disclosure of the mental state of the model, it omits minor details (the Portrait of the old soldier, CA. 1630, St. Petersburg, State Hermitage). They created the first narrative painting (the Expulsion of the merchants from the temple, 1626 Moscow, Pushkin Museum im. A. S. Pushkin; Changed, 1627, Berlin — Dahlem), paintings that scientists (the conversation of the sages, 1628, Melbourne, national gallery; a Scholar at table, 1628, London, national gallery; Portrait of a scholar, 1631, St. Petersburg, State Hermitage). By carefully studying the art of printmaking, he creates a lot of drawings, engravings, etchings. At the end of 1631 Rembrandt, a famous portraitist and author of historical paintings, moved to Amsterdam, the largest commercial city. 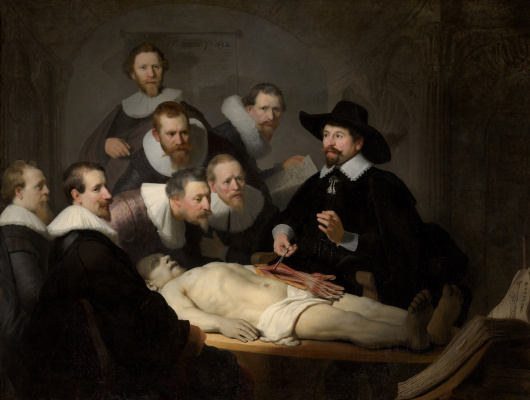 One of the first paintings by Rembrandt in Amsterdam, ball painting the anatomy Lesson of Dr. Nicolaes Tulp (1632, the Hague, Mauritshuis), referring to the tradition of group portrait. The artist conveys the likeness of all the characters, but in contrast to the tradition of group portraits, where each model is equivalent to the situation here, all the characters are emotionally subject to the Tulpa. The painting caused great interest, and Rembrandt became one of the fashionable young portrait painters of Amsterdam. In 1634 Rembrandt married the daughter of the former burgomaster of Leeuwarden — Saskia van Uylenburg, noble and wealthy patrician. After his marriage he bought a big house. Furnished house with luxurious things, the artist creates a rich collection, which included works by Raphael, Giorgione, dürer, Mantegna, van Eyck, engravings from the works of Michelangelo, and Titian. Rembrandt collected Persian miniatures, vases, bowls, authentic antique busts, Chinese and Japanese porcelain, Venetian glass, expensive Oriental fabrics, costumes of different peoples, tapestries, musical instruments. 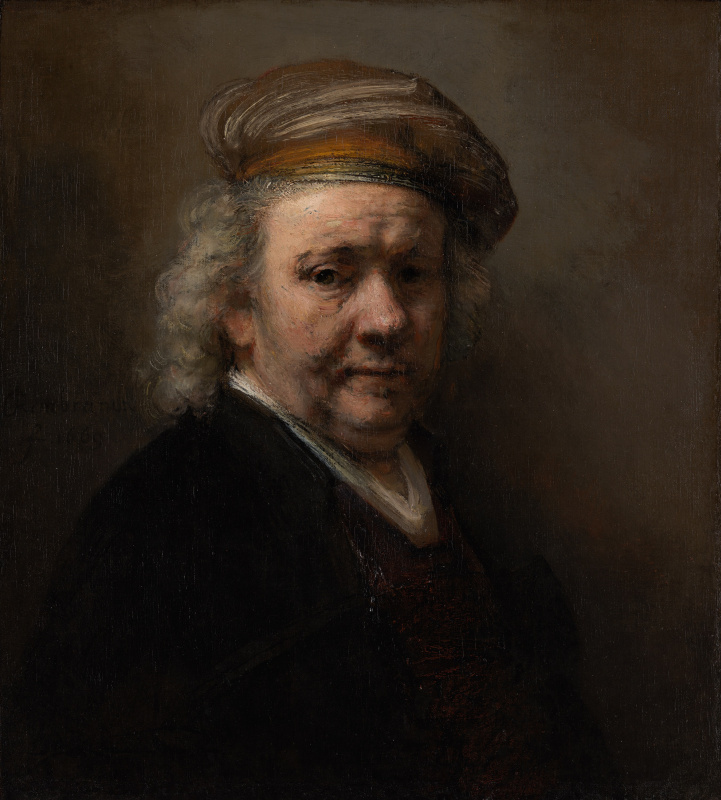 In the 30 years of the Rembrandt — a prosperous, successful, wealthy artist that is reflected in his works. In many paintings he depicts his beloved wife Saskia (Portrait of smiling Saskia, 1633, the Dresden Art gallery; flora, 1634, St. Petersburg, State Hermitage Museum; Wedding of Samson, 1638, Dresden, State art gallery). Especially notable is the famous self-Portrait with Saskia on his lap, (1635, Dresden, State art gallery). He shows himself a Jolly gentleman with a wine glass that hugs polioviruses Saskia sitting on his lap with his back to the viewer. The picture is full of vitality, energy and filled with love for his wife. To this period belong famous paintings on biblical themes (the Feast of Belshazzar, 1634, London, national gallery; Sacrifice of Abraham, 1635, St. Petersburg, State Hermitage Museum), landscape (Landscape with a pond and arched bridge, 1638, Berlin — Dahlem; Landscape with storm, 1639, Braunschweig State Museum Herzog Anton Ulrich), portraits, etchings. This is the time when Rembrandt perfected his technique of painting and graphics, making their creations extreme expressiveness and depth. Learning traditional writing methods and approaches to the disclosure, it is increasingly moving away from these traditions. Instead of smooth, translucent strokes, which are applied thin layers of transparent and translucent colors over a dense layer of paints and create a unified pictorial surface of the canvas, he paints a sharp, pastose strokes, gradually refusing from the detailed details. 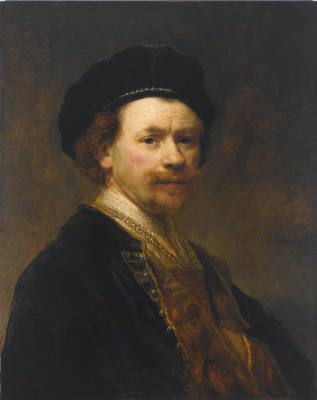 By the early 40-ies of the Rembrandt is a popular and highly paid painter. For 30 years he had written about 60 of custom portraits. He has about 15 students. One of the most famous Rembrandt’s paintings of this period — Danaya (1636−1646, Saint-Petersburg, the State Hermitage Museum). By placing the mythological character in the alcove luxury of a wealthy Dutch burgher house, he masterfully prescribes velvet curtains, fancy embroidered pillow, admiring the rays of Golden light, soft waves flood the beautiful naked body of Danae. Work on the painting he began writing during the period of family happiness at the Zenith of fame. But in subsequent years, much has changed: three children die of Rembrandt, a few months after the birth of the last son, Titus, died beloved wife Saskia (1642), he soon loses his mother and sisters. One of the last portraits of his wife was the Last portrait of Saskia (1643, Berlin — Dahlem). In the early 40-ies of Rembrandt receives an order from the captain of the squad of Frans banning Coca on a large group portrait of his squad to the main entrance hall of the new building of the Amsterdam rifle Guild. Created the famous Night watch (1642, Amsterdam, Rijksmuseum) (3,87−5,02 m). A detachment of 18 figures is a single unified group, surrounded by the townspeople. Arrows, acting on a hike, out of the arch of the building, into the lighted area, under a waving flag. 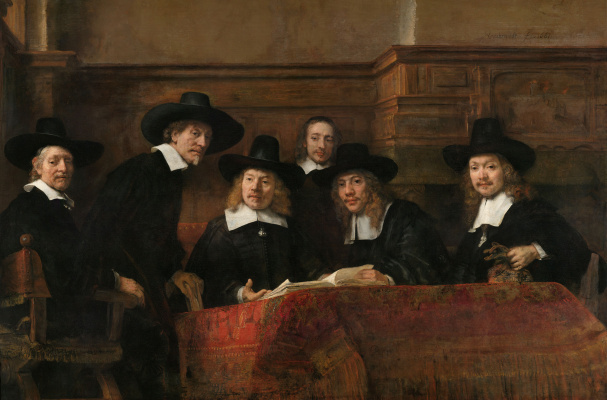 Group portrait takes on the character of the original historical paintings, in which Rembrandt embodies his idea of civil ideals. Opinions of contemporaries about the painting were divided: some saw the masterpiece that others, including customers, found that the painting does not meet the tradition of the group portrait. So it hung another, smaller, not meant for her, cutting the canvas from all sides, broke the composition of the picture. Despite this, it is an unsurpassed example of group portraits, where each character is given a sharp psychological characteristics. 50-e and 60-e years were marked by the creation of a remarkable work, and a deepening of the conflict of the artist with the authorities. Displeasure of the authorities was the fact that his common-law wife Hendrickje Stoffels becomes, a former servant in the house of Rembrandt. 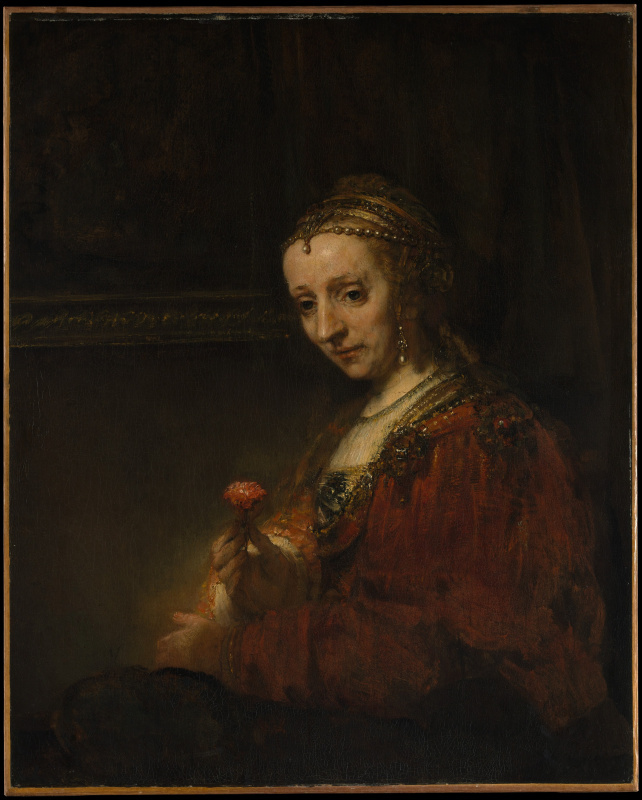 The artist could not officially marry her, because according to the Testament of Saskia Rembrandt at the conclusion of the new marriage would be deprived of the right to be the guardian of the inheritance of his son Titus. The Church persecuted Hendrickje for her relationship not sanctified by marriage. Rembrandt Hendrickje repeatedly portrays, she becomes a model (Portrait of Hendrickje in goodly apparel, 1654, Paris, Louvre; Portrait of Hendrickje Stoffels, 1657−1658, Berlin — Dahlem; the image of Mary in the painting the Holy family, 1645, St. Petersburg, State Hermitage Museum, also inspired by its features). Rembrandt almost completely deprived of orders. At this time, he paints pictures on biblical and mythological themes: Joseph accused by the wife of Interia (1655, Washington, national gallery), Christ at Emmaus (1648, Paris, Louvre). 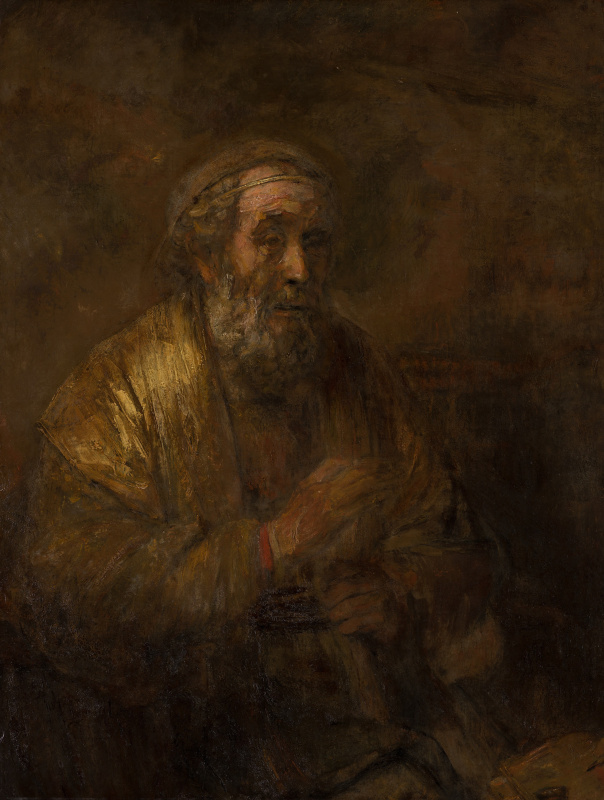 In the centre of Rembrandt’s work — the man, his inner world, experiences and joy. Paying close attention to the portraits, he focuses on uncovering the emotional world of their models: the Portrait of an old woman (1654, Moscow, Pushkin Museum im. A. S. Pushkin), the Portrait of an old man in red (1654, St. Petersburg, State Hermitage), Titus reading (CA. 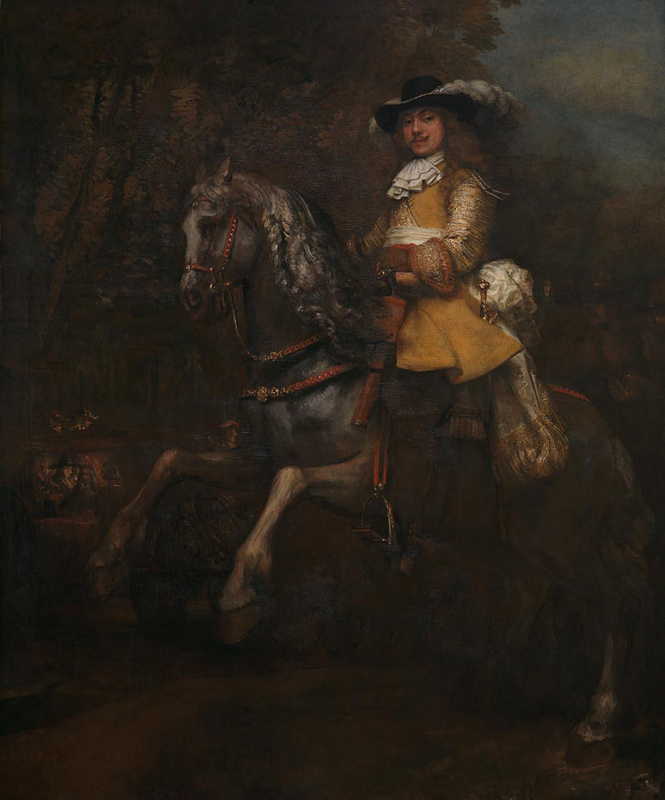 1657, Vienna Museum of art history), Portrait of Jan six’s (1654, Amsterdam, six Collection). The same type of portraits are and late self-portraits of the artist, affecting a diversity of psychological characteristics: self-Portrait (CA. 1652, Vienna Museum of art history), self-Portrait (1660, Paris, Louvre). Rembrandt gets so rare at that time picturesque orders: Aristotle, thinking of the bust of Homer (1653, new York, Metropolitan Museum). Acquired in the years of financial prosperity luxury house, Rembrandt was only paid half of the amount. The remaining debts, especially after the death of Saskia gradually led the artist to bankruptcy. Lenders to submit formal complaints, seeking court decisions on imprisonment. In a campaign of harassment of the artist are included and relatives Saskia, with whom during the life of Saskia Rembrandt was a conflict, because they claimed that the artist squandering the state of his wife. Although in that period Rembrandt made his labor as worth giving in to his wife, has assembled a superb collection of art treasures. Again, the Church is condemning its cohabitation with Hendrickje, their daughter Cornelia is declared illegitimate. In 1656 at the court of the Amsterdam town hall Rembrandt declares insolvent debtor, was carried out an inventory of the property, 1656−1658 was his sale. The real value of the property of the artist several times exceeded the size of his debts: the collection was estimated at 17 thousand guilders. But was sold for only 5 million, the house was valued twice cheaper than its original cost. But not all creditors were satisfied. 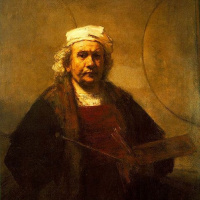 And the court ruled that all of the paintings that will be created by the artist, must be sold to repay the debt, the court also denied Rembrandt’s rights to have property, excluding clothing and accessories for drawing, which meant a miserable existence. The family of Rembrandt moved to the poorest quarter of Amsterdam. Titus after the destruction of the father, to make your property unavailable to creditors of Rembrandt, is a will in which his entire fortune and leaves the sister of Cornelia, Rembrandt appoints a guardian with the right to use the money. Despite the plight of Rembrandt continues to write. Mostly self portraits, family portraits (Portrait of Titus, 1660, Baltimore, Meeting of Jacobs), again turns to the biblical image of David (David before Saul, 1657, the Hague, Mauritshuis). In 1660 Titus and Hendrickje opened an antique shop, where Rembrandt was designed to work with a expert. And although the court’s decision again written by Rembrandt paintings had to go in the order of creditors, the contract of employment it to work, enabled the artist to transmit their works in an antique shop. This has enabled the family to increase their income and buy a house. Again the artist is drawn to self-portraits, to paintings on the biblical theme (Ahasuerus, Haman and Esther, 1660, Moscow, Pushkin Museum im. A. S. Pushkin). Among other artists he commissioned for the decoration of the Amsterdam town hall (the Conspiracy of Julius Civilis or Oath of Batalov, 1661, Stockholm, national Museum). Picture (size approx. 30 square meters) returns the artist to "fix". 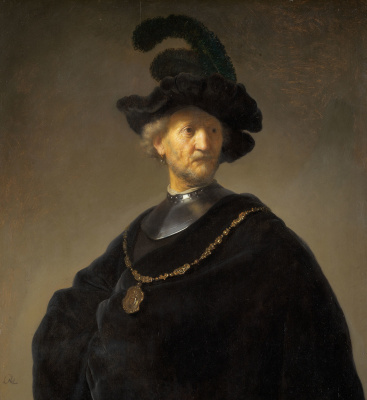 But Rembrandt refused to amend, and the order was given to another artist. On the part of the canvas by Rembrandt was done another order — the famous group portrait of Syndic (1662, Amsterdam, Rijksmuseum). The Syndic, officers, corporations shop clothiers sitting at a table in formal black suits. The clarity and balance of composition, greed, and the accuracy of the selection of details, creating a solid image of a group of people, an unusual perspective, emphasizing the monumental character of the image, the solemnity of what is happening will take a picture of the great masterpieces of painting. In 1663 Hendrickje dies, which by his leave Titus antique shop, and Rembrandt — a small inheritance. Rembrandt becomes the guardian of his daughter Cornelia. After two years of creative break, he wrote a number of famous paintings: David and Uriah (1665, Saint-Petersburg, the State Hermitage Museum), the Jewish bride (1665, Amsterdam, Rijksmuseum), Family portrait (1668−1669, Braunschweig, State Museum and the Herzog Anton Ulrich). But the real apotheosis of all of Rembrandt’s work was a picture of the Return of the prodigal son (1668−1669, Saint-Petersburg, the State Hermitage Museum). Repeatedly the artist turned to this topic (outlines and sketches have been Dating for 30 years). On a huge canvas (260×205 cm) from the back shows a kneeling figure of the son, who returned under the paternal roof. In his figure embodied the repentance of the one who passed the tragic way of learning. Wise and soulful face of the old father, sanctified by the great kindness of accepting and forgiving son, a masterpiece of Rembrandt, the master, able to penetrate the soul of their characters and show all their emotions on the canvas. This is a painting about suffering and great love. In February 1668 Titus married Magdalena van Loo, but died shortly thereafter. It dealt a crushing blow to Rembrandt, and on 8 October 1669 he dies at the hands of his daughter Cornelia. The artistic heritage of Rembrandt is huge: about 600 paintings, nearly 300 etchings and 1400 drawings. It affected the works of his pupils, the most famous of which Gerrit Dou, Govert Flinck, Samuel van Hoogstraten, CAREL Fabricius, Nicholas Wt. It influenced the development of world art as a whole, although it was appreciated many years later. A wide range of topics, humanism, the search for an expressive artistic means, the greatest skill allowed the artist to bring to life advanced ideas of the time. The great emotionality of his works, created by the coloration of the paintings, which is built on a combination of contiguous warm tones and subtle shades of color. Rembrandt left a huge scenic heritage, creating paintings on biblical, historical, mythological and everyday themes, portraits and landscapes, was a great master of engraving and etching. A Central focus in his work he assigned to man, his inner world, his feelings, opening up his spiritual wealth. Creative statue of Rembrandt stands in the centuries along with the largest representatives of the world of art.